We are fighting for humanity and the right to celebrate our freedoms, particularly the right of private property. 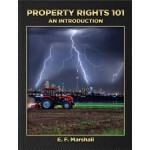 Titled Property Rights 101 – An Introduction, this book is available online through the Ontario Landowners Association store for $40. After paying the fee, the book is available to you for downloading. It contains more than 200 pages.